An improvement in quality of life followed by an increase in resource consumption has had several unintended negative impacts on our urban environment. One of the outcomes of this increased resource consumption pattern is the large amount of waste generated from the various urban centers everyday. Such is the magnitude of this waste that it is far beyond the handling capacities of Governments and other urban agencies. Consequently, cities are now grappling with the problem of high volumes of waste and the cost involved in managing such waste. Urban waste usually includes normal household waste. Rapid urbanization along with a constantly modernizing social behaviour has led to the doubling of household waste generation. The local municipal bodies with their limited human, technical, financial and institutional capability, particularly in a developing country like ours, have repeatedly demonstrated their inability to cope with the multi-dimensional problems of urban waste management. At the same time, it is important to either dispose off all of this waste as soon as it is generated or reduce waste generation, as waste has a huge impact on regional and global environment. Thus, the absence of adequate waste management infrastructure poses serious environmental risks that, in the long run, may even hamper a nation’s development. Addressing the issue of managing household solid waste can go a long way in improving the performance of an urban waste management system as a whole. While long term improvement in urban waste management can only occur gradually through institutional strengthening and infrastructure development, community involvement is the best means of short-term waste management. At the same time, if done effectively, community participation can even prove to be a permanent long-term solution. Community participation is the process by which individuals and families assume responsibility for the health and welfare of their communities and contribute to the community’s overall development. It should be pointed here that every urban citizen can play a crucial role in improving the municipal solid waste management system in many ways. Management of solid waste is a complicated task because of its close and direct relationship with the behaviour of the society. Therefore, social awareness and initiation is a key factor for a long term solution to the waste management problem. To address this issue, awareness campaigns must be carried out at the community level explaining the importance of the desirable 3 R’s – Reduce, Reuse and Recycle. These programmes should be facilitated by the Resident Unions or the Resident Welfare Associations (RWAs) of the respective communities. Urban Communities need to act in a more responsible way and the elders must teach the importance of a clean environment to the younger generation. The society should try to reduce the total waste generated by cutting down unnecessary consumption which is also a stepping-stone leading to sustainable development. The elders of the community should behave even more responsibly and not litter or be insensitive to issues related to waste as they are also the role models for the next generation. The biggest problem in urban waste management is faced at the stage of segregation of waste. If the waste is segregated properly, it can be disposed off in a more environment friendly manner. However, it is a difficult task and presently, all of the non-segregated waste is dumped at the same place. Communities can come forward and solve this problem to a great extent. This is because segregation of waste is most efficient when carried out right from individual houses. Waste should be divided into two broad categories at individual house level and then to broader categories at the community level. The adequately segregated waste can then be collected by the local municipal authority who can now deal with it in a better way. Such a measure will significantly reduce the amount of domestic solid waste entering urban waste streams and going to landfills, thus contaminating the environment. Small community level composting pits can be maintained by different colonies for composting kitchen waste. This will further reduce the total waste entering the urban waste stream to a great extent. Through adopting simple technologies such as vermin-composting, the waste can be converted to manure and the manure so produced can be sold on a commercial basis. The money earned can be utilized for the maintenance and sustenance of such a community based compost system. 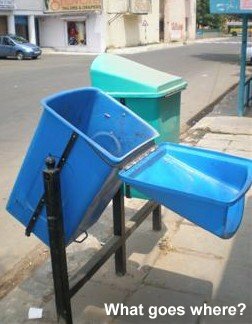 This type of community level waste management system has already been adopted by IIT-Delhi and should be replicated in other communities as well. Thus, urban communities can play a pivotal role in urban waste management through their participation in household waste reduction, waste segregation, adopting recycling practices, composting, deriving manure from organic waste, exhibiting willingness to pay for waste collection services and by collaborating with waste collection crews. With increasing urban migrations and consequent increase in the population of cities, all urban communities at all levels should soon realize their role and contribute to waste management in order to keep our cities clean and green. Govind Singh, Excellent article. I think you did a fine job displaying how urban communities can make a difference in waste management world. Many of us fail to realize that and it is often overlooked. Thank you for encouraging us to keeping our cities clean and green. plz send related research articles on effectiveness of teaching on domestic waste management.. Very informative article. We all need to behave sensibly in the management of house waste. This aspect should be a vital part of the teaching curricullum at all levels of education. This article is well written and can have good impact on the society. These days in the schools house hold waste management is being taught. I am sure, students will take this message home and share with their family members and friends. This article is well written and can have good impact on the society. These days in the schools house hold waste management is being taught. I am sure, students will take this message home and share with their family members.